It’s time for another round of Craft Lightning! 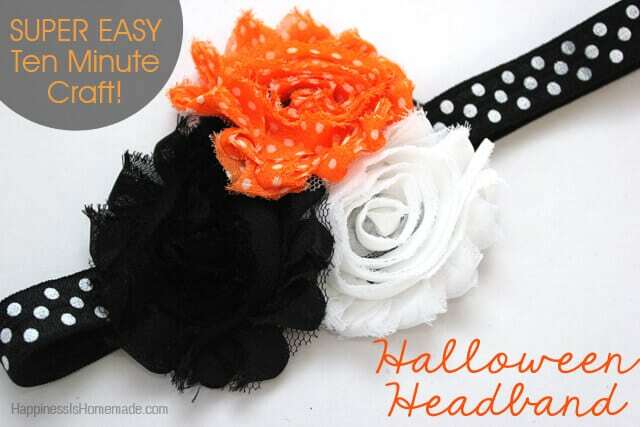 Today’s lightning fast craft is this adorable shabby flower Halloween headband that you can whip up in about ten minutes flat. This project can be adapted to fit any color scheme, holiday or theme, but I just loved this mix of polka dots, and I knew this combo would be perfect for the Halloween season. I didn’t even stop to take any step-by-step photos of this project since it would have ruined my lightning fast crafting speed! Honestly though, it’s crazy simple, so I don’t think you need them. Cut a 16″ length of elastic. 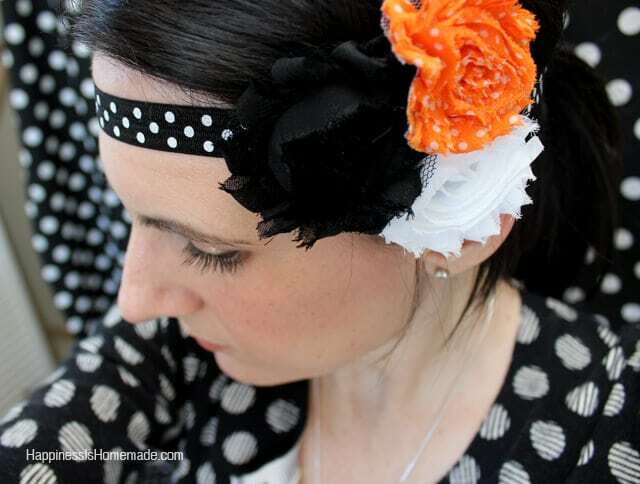 Overlap the two ends by 1/2″ and hot glue them together to form the headband. Lay your flowers on top of the piece of felt and arrange them however you like. I like to overlap my flowers just a bit. Trim the felt [as shown above] to fit the flowers. You can save this for the final step if you’d like, but I prefer to trim it before I glue everything in place. Run a line of hot glue lengthwise across the felt piece, and glue the headband to the felt. TIP: position the glued seam of the elastic band to the middle of the felt piece so that it will be hidden once your headband is complete! Glue the flowers to the felt, covering up the elastic band in the process. All done – easy peasy! I had hoped that my cute little neighbor would show up at my house this afternoon to model it for you, but she was busy, so you get another photo of me (wow, two days in a row!). Ha, my outfit matched/blended into the photo background today! Totally unintentional, I swear. I just LOVE me some polka dots. I had planned on giving this headband away as a gift, but now I’m thinking I just might keep it for myself after all! « Got Boy Related Crafts or Activities? Come Link Up! Love it. Where do you buy polka dot elastic? Such a cute headband! I love those shabby flowers!